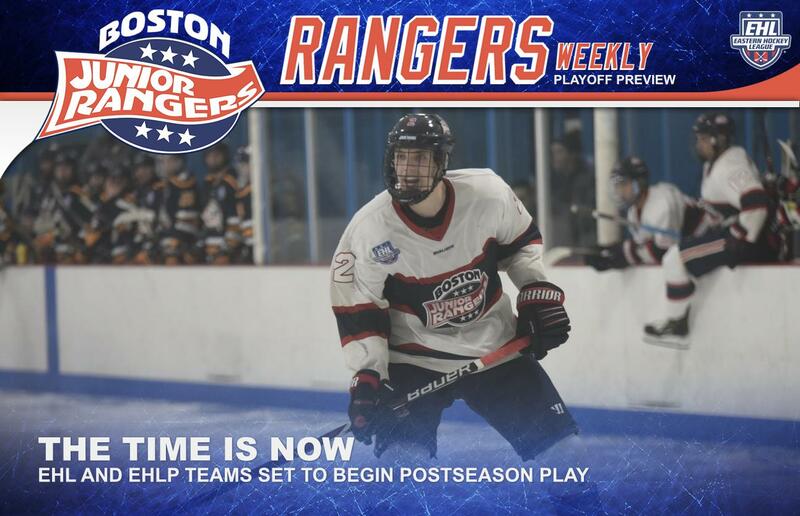 TEWKSBURY, MA -- After a long regular season, both Rangers teams have clinched a spot in the playoffs as the EHL squad will enter as a #4 seed and will face-off against the Seahawks Hockey Club in the First Round. The EHLP squad on the other hand, won the Regular Season Championship and earned a #1 seed. They will face-off against the Vermont Lumberjacks in the Conference Semi-Finals. The EHL team finished off the regular season on a high note, winning their last three games on the schedule. Last Wednesday, the Rangers came from behind and beat the Valley Jr. Warriors in a shootout in their final home game of the season before beating the East Coast Wizards in overtime last Friday. The squad then finished the regular season off strong with a 7-1 win against the Connecticut Roughriders. After finishing the season off strong, the Rangers ended up in 3rd place in their division, with a record of 27-15-4. The team scored a total of 174 goals this year, which averages out to 3.68 goals per game. On the other end, the Rangers only let up 113 goals which ranks #5 in the entire league. The Rangers ranked #6 in the league in power-play percentage at 18.9% and were #7 in the league on the penalty kill at 84.5%. Danila Larionovs was the Rangers leading scorer in the regular season with 14 goals and 27 assists (41 points). The Rangers leading goal scorer from last season Zack Norby wasn't far behind with 36 points this year. John Grealish also had himself a solid season with 13 goals and 23 assists (36 points). Andrew Keith led the Rangers in goals with 25 and had 10 assists on top of that for a total of 35 points for the year. Anton Metelev led all defensemen on the team in scoring, with six goals and 15 points. Larionovs, Metelev, and Martin Pietraszek were all tied for the lead in power play goals with four, while Norby led the team in game-winning goals at five. Both Aiden Curry and Billy Girard were tied for the lead for most wins between the pipes with 12. Both goaltenders have themselves terrific seasons as Curry held a 12-6-0 record with a 2.55 GAA, along with a shutout. Girard on the other hand, had a 12-7-2 record, with a 2.40 GAA and a pair of shutouts. Jacob George also contributed in net with a 2-0-0 record and only allowed only one goal in the victories. The Rangers are set to face-off against the #5 seed Seahawks Hockey Club in the First Round of the EHL Playoffs. The squad had a 2-1-0 record against the Seahawks this season, but won the most recent matchup between the two teams by a score of 3-2 back in February. The best-of-three series is set to start on Saturday night at Breakaway Ice Center at 7:50pm. Game #2 is scheduled for Sunday afternoon in Dennis at 2:30pm and Game #3, if necessary, will be played back in Tewksbury on Monday at 1:00pm. The EHLP squad finished off their regular season this past weekend in Connecticut with a pair of matchups against the Chiefs. After losing the first game and winning the second, the Premier team ended the year as back-to-back Regular Season Champions with a record of 34-4-4. They will enter the playoffs as a #1 seed and will face-off against the Vermont Lumberjacks on the Conference Semi-Finals. The Rangers led the entire EHLP with 244 goals scored and also led in goals per game average at 5.81. On the other end, the Rangers only let up 89 goals and had six shutouts during the season, which put them at the top of the entire league. On top of that, the Rangers were #2 in the league in power-play percentage at 24.1% and led the league on the penalty kill at 91%. Matt Orlando led the team in scoring with 25 goals and 35 assists (60 points) on the year, and was 4th in the entire league in points. Matt McPherson led the Rangers in goals with 27, and wasn't far behind in points with 53. The Rangers also got big time scoring from other forwards as Luke Marsh, Nick Weaver, Jake Mecrones, Tanner Caldarola, Dennis Engelson, and Levi Hensley all had point per game averages over 1.00. Josh Barton led all defensemen on the team in scoring with five goals and 27 assists, and ranked #4 among all defensive in the league in assists. Bobby McCloskey led the way for the Rangers in net this season, posting a 17-3-1 record, with a 2.25 GAA and a pair of shutouts. McCloskey’s 17 wins ranked him #2 in the entire league and the Marblehead native led the entire league in save percentage at .926. He was also ranked #2 in the league in GAA, behind Rangers teammate Cam Libby. Libby also had himself a terrific season with a 13-1-1 record, with three of those wins coming via shutout, along with a league-leading GAA of 1.99.